It seems as though every week, there’s a news report or some new research is telling us about the latest weight-loss fad. You know what I am talking about: “If you drink lemon juice before you eat a meal”, “If you eat a grapefruit”, “hot peppers, cinnamon, etc. etc.” you will lose weight! I am here to bust some of those myths for you and also support some of those crazy sounding theories. Here are Dr. G’s top 5 favorite fat-burning myth busters. According to the grapefruit diet plan, you can lose 10 pounds in 12 days! It is believed that grapefruit can reduce your appetite and therefore promote weight loss. The theory behind the grapefruit diet is that you eat half a grapefruit before every meal to reap the fat-burning effects. And grapefruits do contain certain enzymes that speed up the way our body burns fat. 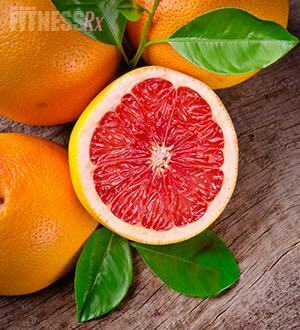 One half of a ruby red grapefruit contains 37 calories, 9 grams of carbohydrates, 0 grams of fat, 1 gram of fiber and 1 gram of protein. Grapefruits also contain a flavonoid called naringenin, which is responsible for grapefruit’s bitter flavor. It also has antioxidant and anti-inflammatory effects, which also play a role in metabolism. Naringenin activates the nuclear receptor, PPARy, which increases insulin sensitivity, allowing glucose uptake into the cells. Increased insulin sensitivity will help to decrease abdominal fat. Narningenin also inhibits the nuclear receptor, LXRa. The inhibition of this receptor causes a decrease in lipogenesis (making of fat cells). PPARa is activated by fatty acids released in a fasted state and increased beta oxidation (fat metabolism). This is why the grapefruit diet recommends eating the grapefruit BEFORE a meal. But eating half a grapefruit before every meal could turn into a citrus frenzy! Drinking Green Tea Helps to Burn Fat! Green tea contains polyphenols that have a potent antioxidant effect. Ninety percent of these polyphenols are catechins. There are three times more catechins in green tea than black tea, and it is these catechins that are responsible for green tea’s positive effects on the body. The main role of catechins is to inhibit catechol O-methyltransferase, an enzyme that degrades norepinephrine. Since norepinephrine is NOT being degraded, this could potentially prolong adrenergic drive, and result in a significant increase in lipolysis. An increased adrenergic drive triggers a metabolic cascade where the end result is the phosphorylation of hormone sensitive lipase, which stimulates the breakdown of fat. The effects of green tea are even more potent with exercise, since exercise also increases adrenergic stimulation. The combination of consuming green tea during exercise further increases adrenergic stimulation by blocking the enzyme catechol O-methyltransferase and creates an increased fat availability for fuel. Studies show that the lipolytic effects of green tea are not merely the result of caffeine. 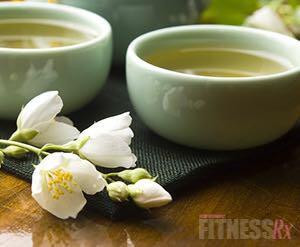 Green tea promotes thermogenesis (the process of heat production) and fat metabolism to a higher degree than caffeine. Studies show that participants drinking green tea have a greater fat oxidation than participants drinking only caffeine. So how much green tea do you have to drink? To achieve the lipolytic effects, one particular study suggests taking one green tea capsule three times a day. One capsule is equal to approximately three and a half cups of tea. Instead of drinking large amounts of green tea, you can take green tea extract, which is a supplement generally found in a capsule form that provides a high dose of the catechins found in green tea. However, it should be noted that there are a few adverse effects of drinking that amount of green tea. One adverse effect is the caffeine content in green tea could be problematic for those with extreme heart conditions that are prone to experiencing cardiac arrhythmias. Another is that increased concentrations of green tea could decrease the bioavailablity of iron in the body. Eat Cinnamon to Burn Fat! Cinnamon contains a beneficial spice called cinnamomum cassia, which has beneficial effects that come from methylhydroxychalcone (MHCP). MHCP is a polymer and the main compound found in cinnamon. It is responsible for the improved glucose levels seen with cinnamon therapy. This is used in the treatment of type 2 diabetes because it slows the rate of gastric emptying after a meal and improves glucose uptake, which reduces cholesterol and triglyceride levels. Cinnamon has the biggest effect on blood glucose levels. The uptake of glucose into the cell is stimulated, which stimulates glycogen synthesis, and insulin sensitivity increases. 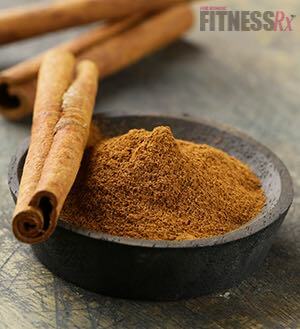 The aqueous form of cinnamon has been shown to increase glucose uptake better than ingesting cinnamon in another form. Lower dosages of cinnamon/extract are recommended. One study suggested that taking 1-3 grams daily for 20 days showed better results than 6 or more grams per day. That’s A LOT of cinnamon! One gram of cinnamon is equal to approximately one-half teaspoon. A recommended single dose would be between one-half to one and a half teaspoons. Cinnamon does not need to be ingested daily because its effects last for up to a day following a single dose. The metabolic effects of cinnamon have an indirect effect on body fat. With the increase in insulin sensitivity and glucose uptake, there can be a reduction in body fat. The greatest effects are seen through a reduction in central adiposity (belly fat). So the weight-loss effects are not a direct effect from cinnamon; instead it is merely an indirect effect from decreasing insulin insensitivity and possibly decreased body fat. Drink Vinegar to Burn Fat! Consuming some vinegar in your diet may help lower your bodyweight and blood glucose levels. The biologically active component of vinegar is acetic acid, which inhibits the activity of several carbohydrate digesting enzymes, including amylase, sucrase, maltase and lactase. As a result, when vinegar is present in the intestines, some sugars and starches temporarily pass through without being digested, so they have less of an impact on blood sugar and body fat accumulation. Vinegar also extends satiety (the sensation of feeling full) after eating. Another hypothesis is that the acetic acid increases the fatty acid oxidation enzymes in the liver, causing an inhibition of body fat accumulation. Acetic acid is the active ingredient in all types of vinegar. 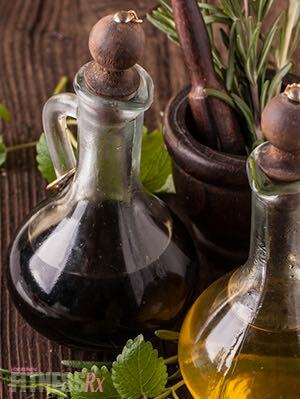 Balsamic vinegar, when consumed with carbohydrates, may help to keep the blood sugar levels from rapidly increasing. This could thereby prevent blood sugar from crashing later, which causes people to eat more. Balsamic vinegars also contain resveratrol, a powerful antioxidant that is derived from various types of berries, especially grapes. It has been shown to have several positive cancer and weight-loss benefits. Resveratrol is known to promote weight loss by triggering the SiRT1 gene that is responsible for reducing fat stores in low-calorie diets. Another type of vinegar, which is favored by many, is apple cider vinegar. Apple cider vinegar claims to be the better vinegar for weight loss because it contains the highest amounts of purifying and health-promoting potassium, which acts as a fat-flushing agent. Apple cider vinegar is also known to increase a person’s metabolic rate, leading to a greater caloric expenditure. It also aids in minimizing water retention in the body, which may increase a person’s energy by making them not feel so sluggish. For weight loss, the recommendation is to drink 1-2 tablespoons of vinegar mixed with 8 ounces of water before each meal. I am not sure I would call that a refreshing beverage! 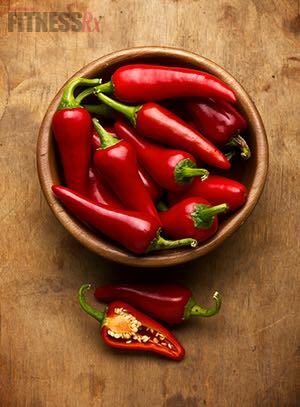 Eat a Hot Pepper to Burn Fat! Capsaicin is the heat-causing chemical found in hot peppers, and it is known to be effective in helping people either suppress appetite or lose weight. Capsaicin increases catecholamine secretion from the adrenal medulla, which stimulates beta-1-adrenergic receptors in the body. This metabolic cascade will phosphorylate enzymes such as hormone sensitive lipase that increase lipolysis and beta-oxidation. For several hours after consuming a meal containing capsaicin, the body burns more calories and fat. In addition to calorie burning, capsaicin may decrease your appetite. If you eat a spicy meal containing capsaicin, you potentially could reduce food intake by about 200 calories. Another route for capsaicin producing thermogenesis comes from both up- and down-regulation of uncoupling proteins (UCP) in the body. The uncoupling proteins 1, 2 and 3 (UCP1, UCP2 and UCP3) are negative ion carrier-proteins located in the inner membrane of mitochondria of your cells. These proteins primary function is to increase energy expenditure by losing energy instead of storing it. Animal and cellular research has shown that various capsaicin dosages can stimulate these UCPs and enhance calorie burning. The underlying potential problem may be the amount of capsaicin that needs to be consumed to possibly achieve these benefits. Capsaicin would have to be consumed in large amounts, and that may be too hot for anyone’s taste! A possible solution may exist for those who do not appreciate the flavor of spicy peppers. Some peppers produce a version of capsaicin called dihydrocapsiate (aka DCT) that has a mild taste. So that wraps up my top 5 five favorite myth busters. As you can see, some of them are not myths at all, and some contain a certain ingredient that may indirectly increase metabolism and thermogenesis to help achieve weight loss. The obstacle, however, is the rather large amounts of each that you need to eat in order to reap the potential weight-loss benefits! 1. Baker, W. L., G. Gutierrez-Williams, C. M. White, J. Kluger, and C. I. Coleman. “Effect of Cinnamon on Glucose Control and Lipid Parameters.” Diabetes Care 31.1 2007: 41-43. 4. Diepvens, L., Westerterp, K., & Westerterp, M. Obesity and thermogenesis related to the consumption of caffeine, ephedrine, capsaicin, and green tea. Am J Physiol Regul Integr Comp Physiol. 2007;292(1). 77-85. 5. Dulloo, A.G., et. al. Efficiency of a green tea extract rich in catechin polyphenols and caffeince in increasing 24 hour energy expenditure and fat oxidation in humans. Am J Clin Nutr; 1999: 70(6):1040-1045. 6. Galgani J., & Ravussin E. Effect of dihydrocapsiate on resting metabolic rate in humans. Am J Clin Nutr. 2010 Nov;92(5):1089-93. 7. Khan, A., Mahpara, S., Muzaffar, M., Khattak, K. N., & Anderson, R. A. Cinnamon improves glucose and lipids of people with type 2 diabetes. Diabetes Care, 2003: 26(12), 3215. 8. Kondo, T. et al. Vinegar intake reduces body weight, body fat mass, and serum triglyceride levels in obese Japanese subjects. Biosci, Biotechnol, Biochem, 2009; 73: 1837-1843. 9. Kondo, T et al. Acetic acid upregulates the expression of genes for fatty acid oxidation enzymes in liver to suppress body fat accumulation. J. Agric. Food Chem., 2009; 57 (13): 5982–5986. 10. Venables, M., Hulston, C., Cox, H & Jeukendrup, A. Green tea extract ingestion, fat oxidation and glucose tolerance in healthy humans. Am J Clin Nutr; 2008: 87(3):778-784.